Roger seems to have got his nuts in a twist over this QR campaign. Running a campaign, which is titled "It's Morning Somewhere" and the idea behind the campaign is that anytime is like breakfast time - a great time to eat and enjoy Crunchy Nut cereal. 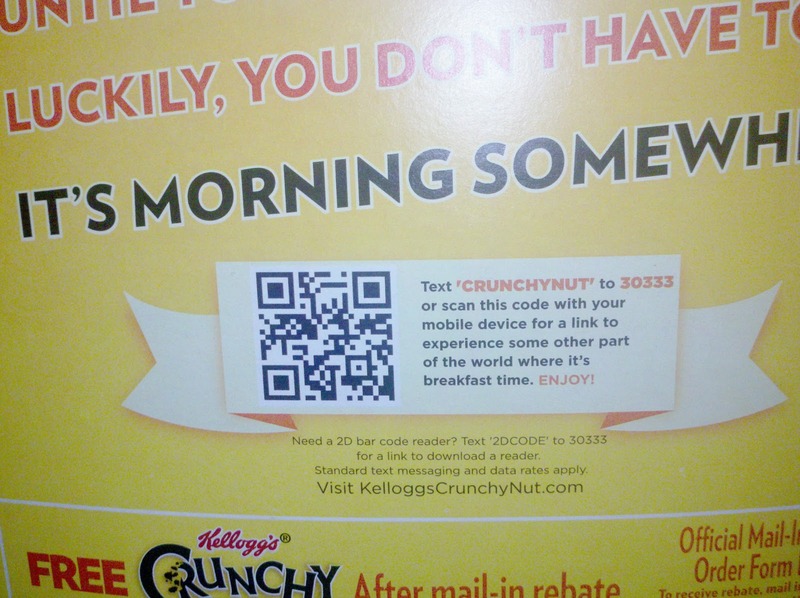 To promote the campaign, Kellogg's has placed a QR Code on the back of Crunchy Nut cereal boxes. When the code is scanned, the customer is brought to a very simple mobile page, which is divided into three sections. The top section displays a product logo, the middle section is a video screen which displays the copy "Right Now: It's Morning in Magnolia, Washington" and the bottom section displays an image of a cereal bowl with the words "It's Morning Somewhere." I posted a comment to Roger that he hasnt approved yet. I actually thought the campaign was cute idea. Had potential to go viral so surprised i'm reading about it here. Augme needs to implement viral tools in their product portfolio (though mybe they pitched twitter/facebook integration but go shot down. Thank you for mentioning my blog post but, for your edification, I did post your comment to my blog and it appeared under the original post (see this: http://bit.ly/f2SPdJ). Although I did not respond to your comment on my blog, I did respond to your comment on LinkedIn. 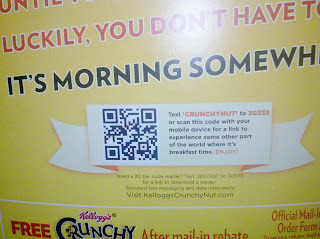 Essentially I agree with you...the campaign tag line "It's Morning Somewhere" is a great line and theme, and it could have been taken in a number of interesting, interactive and fun directions, but this advertisement with a QR Code just didn't achieve this. That was the main point I was trying to make in both of my posts.